Looking for a Business and Accounting course in Birmingham? Our BSc Business Accounting degree is accredited by ACCA, CIMA, ICAEW, AIA and IFA. Designed to equip you with the intellectual and technical building blocks to kick-start your career in business and accounting, this degree's professional accreditations enable fast-track progression into the world of accountancy. You'll also have the option to take a year-long sandwich placement in industry during your course. You will study accredited modules that are designed to meet high standards, and you’ll also have the option to undertake a full year’s work placement, gaining vital real-life skills. As you progress, you will become more effective and creative as a problem solver and be able to critically advise individuals and companies on a range of business-related matters. You’ll develop the professional accounting skills required of any senior manager and have the flexibility to customise your own programme during the second and final years to become a specialist in economics, taxation, project management or international business. Completing the course will not only enable you to follow careers in accountancy, but careers in any aspect of business, as you’ll have an in-depth understanding of all aspects of business operations. Students are satisfied with our courses! Our Accounting courses scored 93 per cent for overall satisfaction in the National Student Survey 2018. This degree course is accredited by the ACCA, CIMA and ICAEW professional bodies for maximum exemptions. This means that the course is as professionally relevant and up-to-date as possible, taking into account the very latest developments in the profession. In this module, you will learn to interpret published financial information and to apply accounting principles to the preparation of financial statements. In this module, you will use both short and long term decision making techniques to make commercial and investment decisions as well as assessing the performance of organisations against budgets and forecasts utilising advanced variance analysis. In this module, you will evaluate the role and contribution of the operations function in modern businesses. You’ll apply theoretical principles, tools and concepts to business operation problems to deliver sustainable performance, and use theoretical principles to establish how relationships in the supply chain can be managed. Here you will learn to differentiate between the different approaches for strategic development, and analyse and recommend an appropriate Strategic Implementation strategy. This module will develop your skills in both the preparation of financial statements for single and group companies (in accordance with the IASBs Conceptual Framework for Financial Reporting and relevant International Financial Reporting Standards) and the analysis and understanding of such financial statements. This module will enable you to develop skills relating to the general principles of taxation, the UK tax framework and regulatory environment. The module will introduce the computational aspects of income tax, national insurance contributions, capital gains tax, inheritance tax in respect of individuals and introduce corporation tax and value added tax for businesses. You will analyse and classify an organisation’s current e-business strategy, identifying their strengths and weaknesses when compared to their competitors. This module is designed to further develop knowledge and skills in the application of management accounting techniques. Building on the knowledge gained from levels 4 and 5, this module investigates how relevant strategic management accounting techniques, both quantitative and qualitative, can assist managers to control the performance of their business. This module builds upon your earlier studies of Principles of Taxation at Level 5 and seeks to explore more complex aspects of income tax, national insurance contributions, capital gains tax, corporation tax value added tax and inheritance tax with an emphasis on tax planning. This module will introduce you to the not for profit environment including the charity and public sectors. In addition to exploring the differences in structure, financing, governance, management and performance measurement of organisations within the not for profit environment, you will review and evaluate the challenges associated with accounting for not for profits and the implications on their operations. Students will explore the concept of planning an operational change within an organisation through the use of project management tools and techniques. The assessment, split into two components of assessment which are individually summatively assessed, will focus on a real organisational problem set by an employer, who will act as the project sponsor of the required change. Initially, project management will be presented within a global environmental context, prior to integrating and focussing industry recognised project management tools and techniques within an organisational setting. During the second and third years of the programme, there will be more flexible learning opportunities that will enable you to specialise in particular subject areas, and to tailor your programme to a particular career aim or professional body. There will also be opportunities to experience different graduate roles, with a wide variety of placements and internships on offer to compliment your studies. All modules will mix face-to-face lectures with online activities. As a practice-based course, sessions will usually involve the application of academic concepts to real-world scenarios. Online delivery will also be provided via the University’s virtual learning environment, and modules will also require you to engage with online study to prepare for, participate in and further develop your skills. CIMA is the largest professional body of management accountants in the world. We offer the most relevant accounting qualification for a career in business; something our 229,000 students and members in 176 countries are proud to be a part of. Management accountants aren’t number crunchers – they are quite the opposite. You’ll find them in all types of organisations, in top positions, analysing trends and behaviours to make informed business decisions. Every top 100 global brand employs CIMA students and members. They know the CIMA qualification equips people with the skills and knowledge they need to be truly successful in business. CIMA has the power to enhance your degree and improve your earning potential. CIMA is the natural progression for people with finance and business degrees. If students have a degree in a relevant subject, they could be entitled to exam exemptions. Find out more about the University to CIMA route. CIMA’s Grad Club is open to all UK students from any degree discipline and free to join. Grad club members will be the first to know about the latest graduate jobs and employer events and will also get exclusive access to industry updates, salary surveys, interview tips and more. CIMA works with a huge range of employers who will sponsor graduates to study the CIMA Professional Qualification. You can find the latest job vacancies on CIMA MY JOBS. This programme shares the same first year as the MAcc Accounting and Finance and the BSc (Hons) Accounting and Finance programmes, so if you’re keen to maximise professional exemptions, you can transfer to one of those courses after your first year. Upon completing your degree, you may be interested in our postgraduate MSc Accounting and Finance course. "One of the best aspects of Birmingham City University is the location - it's right next to the city centre! And there are also lots of books and laptops to help you with your studies." You will be supported throughout your studies by the University Careers and Employability team with the aim of enhancing your employability prospects on graduating. The Faculty of Business, Law and Social Sciences is committed to practice-led learning and teaching that will give you experiences of the world of work through a range of activities which could include work placements, voluntary work, live projects, problem-solving, case studies, visits to businesses and social enterprises. Your programme will provide you with an opportunity to apply your developing knowledge and skills in the workplace either by taking a full year’s work placement in the UK or overseas or through engaging in shorter work placements, internships or voluntary work. Joanna always had an interest in business, having studies it at both GCSE and A Level, and was also really interested in accounting, so the BA (Hons) Accountancy and Business course that Birmingham City University offered was "perfect for me". It gave me a more detailed look into both subjects, and really helped me understand where I wanted my career to go in the future. BCU is such a nice environment to work in, and the lecturers were always happy to help and support me during my time at uni. When she graduated, Joanna won an award for achieving the highest mark in corporate reporting, getting 99% in her final exam. 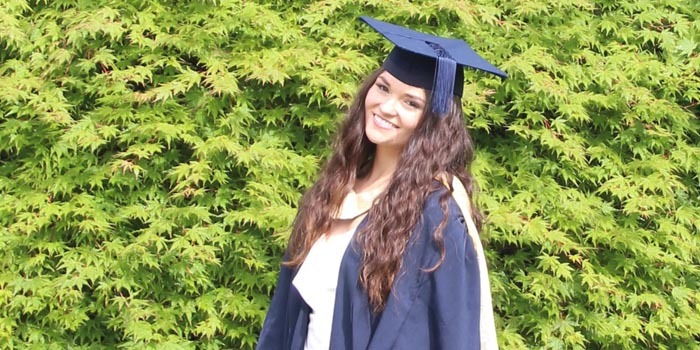 The knowledge and skills gained during her degree helped Joanna attain her current position as a Graduate Resource Planning Analyst for Virgin Media straight after graduating.